It’s very important to treat gum disease promptly to avoid tooth loss & complications. Proper diagnosis and treatment of gum disease (also called gingivitis or periodontal disease) is a priority at LB Dental. Many dental issues can be avoided by promptly treating gum disease. If you notice red or inflamed gums, or experience any pain in your mouth, call us immediately to schedule an appointment! If untreated, gum disease can lead to serious diseases such as periodontitis. Dr. Bundalo will evaluate you, and depending on your specific situation, present you with some options. 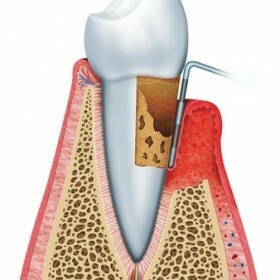 If the gum disease is advanced, a tooth extraction may be necessary. However, in many cases if treated early, we can use dental lasers to painlessly treat gum disease! Be sure to schedule a checkup & cleaning every six months. The best way to fight gum disease is to prevent it in the first place!